From 'The Universal identifying Characteristics of a Cult' (David Brear, Axiom Books, copyright 2005). ‘charity/ philanthropy’; ‘fund-raising’; ‘lobbying’ on topical issues (‘freedom’, ‘ethics’, ‘environment’, ‘human rights’, ‘women’s rights’, ‘child protection’, ‘law enforcement’, ‘social justice’, etc. ); ‘publishing and media’; ‘education’; ‘academia’; ‘celebrity’; ‘patriotism’; ‘information technology’; ‘public relations’; ‘advertising’; ‘medicine’; ‘alternative medicine’; ‘nutrition’; ‘rehabilitation’; ‘manufacturing’; ‘retailing’; ‘direct selling/ marketing’; ‘multilevel marketing’; ‘network marketing’; ‘regulation’; ‘personal development’; ‘self-betterment’; ‘positive thinking’; ‘self-motivation’; ‘leadership training’; ‘life coaching’; ‘research and development’; ‘investment’; ‘real estate’; ‘sponsorship’; ‘bereavement/trauma counselling’; ‘addiction counselling’; ‘legal counselling’; ‘cult exit-counselling’; ‘financial consulting’; ‘management consulting’; ‘clubs’; etc. Repression of all dissent. The leaders of the most-destructive cults are megalomaniacal psychopaths (i.e. suffering from a chronic mental disorder, especially when resulting in paranoid delusions of grandeur and self-righteousness, and the compulsion to pursue grandiose objectives). The unconditional deference of their deluded adherents only serves to confirm, and magnify, the leaders’ own paranoid delusions. This type of cult leader maintains an absolute monopoly of information whilst perpetrating, and/or directing, evermore heinous crimes. They sustain their activities by the imposition of arbitrary contracts and codes (secrecy, denunciation, confession,justice, punishment, etc.) within their groups, and by the use of humiliation, and/or intimidation, and/or calumny, and/or malicious prosecution (where they pose as victims), and/or sophism, and/or the infiltration of traditional culture, and/or corruption, and/or intelligence gathering and blackmail, and/or extortion, and/or physical isolation, and/or violence, and/or assassination, etc., to repress any internal or external dissent. What is the connection between the 'Mafia' and cultism and what has the RICO Act got to do with cults ? The Racketeer Influenced Corrupt Organizations (RICO) Act (enacted by section 901 [a.] of the Organized Crime Control Act) is a United States federal law which (in theory) provides extended criminal penalties for, and powerful civil remedies against, the leaders and agents of ongoing criminal organizations and their de facto associate enterprises. In the early 1960s, after Robert Kennedy was appointed Attorney General, the US Dept. of Justice was given a significant role with a co-ordinated national ‘Strike Force,’ established under the direction of the Inspector General of the US Dept. of Labor. This new initiative was the product of an overt, joint congressional policy to hold the leaders of major organized crime groups to account, as well as dismantle their webs of corrupt political figures, judges, attorneys, trade union officials, senior law enforcement agents, etc. (former Special Attorney in the Organized Crime and Racketeering Section of the Justice Dept.) under the close supervision of the veteran Democratic Senator for Arkansas, John Little McClellan http://en.wikipedia.org/wiki/John_Little_McClellan . Subsequently (guided by Prof. Blakey), a number of individual States (notably, California) enacted similar legislation. The RICO Act appeared for all the world to be directed against the Italian American ‘Mafia,’ although its authors refuted this. Whether intentional or not, the Italian-sounding acronym, 'RICO,' is the name of the fictional anti-hero of the classic 1931 Hollywood gangster movie, ‘Little Caesar’ (starring Edward G. Robinson, directed by Mervyn LeRoy and based on the 1929 Novel by William R. Burnett). The RICO Act was drafted by lawyers for lawyers, and is, therefore, legalistic, but, at first glance, it can appear to be written in plain language, because it also contains some popular terms. Even when deconstructed, the Act (like the enduring phenomenon it addresses) cannot be fully-understood in isolation. In reality, in respect of the ‘Mafia,’ by 1970, the RICO legislators were trying to shut the stable door long after the horses had bolted and begun to breed. - Violent gangs of thieves had been endemic to, and feeding off, Sicilian and southern Italian culture for centuries. However, at the beginning of the 19th century a pernicious phenomenon appeared in Sicily. By the mid-19th century, well-organized, all-male gangs were being described in reports (written by insightful Italian government officials) as ‘sects’ or ‘cults' of 'thieves.' Their main criminal enterprise involved the instigation of a form of perverted belief system in which converts were persuaded of imminent and omnipresent doom, but then they were peddled salvation. This classic cultic racket was based on the fact that fear spreads like a virus and, eventually, can become a way of life. 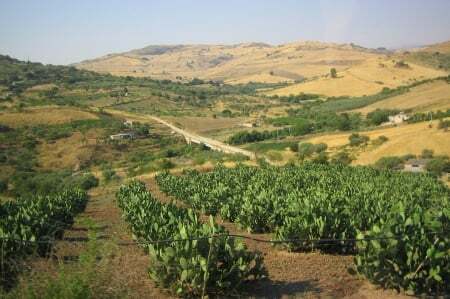 By means of strategic attacks, farmers in certain regions of Sicily (where government was distrusted), became convinced that their crops and homes would be burned and that they, and/or their families, and/or their livestock, would be poisoned, shot, mutilated, etc., if they didn't keep paying for private protection. Like 'Fagin' in 'Oliver Twist,' leaders of these extortion-gangs directed operations and controlled all the profits, exploiting not only victims, but also gang members who displayed unquestioning loyalty to a point where they would lay down their lives. This behaviour has been described as being part of Sicilian culture, but (according to reliable witness testimonies) it was actually produced by co-ordinated, devious techniques of social, psychological and physical persuasion - comprising ritual incrimination combined with ritual initiation into pyramids of secrecy and obedience like those found within 'Catholic,' Military Orders (e.g. the ‘Knights Templar’) and Fraternal Secret Societies (e.g. the ‘Freemasons’). - Although, Sicilian 'cults of thieves' did not have formal names, their adherents became commonly-referred to as ‘Mafiosi’ (those who boast and swagger), whilst the gangs were known as ‘Mafia.' It is interesting to note that the original meaning of 'Mafiosi,' is a good description of arrogant narcissists. - ‘Mafia’ were ruled by a 'Don' ('Father'). These patriarchal positions and the territories they exploited, were passed on within gangs, but they weren't necessarily hereditary. The essentially-identical, secret rituals and structure of 'Mafia,' were never to be written down or passed to the uninitiated. 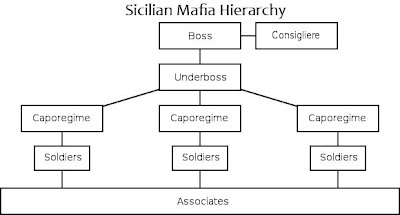 -'Mafiosi' occupied well-defined, military-style ranks in the pyramid of obedience. Although not necessarily related by blood, new recruits (who were often obliged to commit a ritual murder as an act of initiation) swore an oath of 'Family' loyalty. This also obliged them, on pain of death, to respect a strict code of silence, ‘Omerta’ or 'Manhood' (i.e. 'Mafiosi' had to behave like men and settle their own problems). Consequently, if questioned, ‘Mafiosi’ systematically denied not only their own involvement, but also the ‘Mafia’s’ existence. Indeed, once initiated into even the lowest level of secrecy and obedience in a ‘Mafia Family,’ there was no real exit other than death. - During the second half of the 19th century, mass-immigration brought single-ethnic gangs to American cities, particularly New York. One of the earliest Italian cultic gangs to become notorious in the USA was known as ‘A Manu Niura’ ('The Black Hand'). Its leaders specialized in extortion - sending out letters (sometimes printed with a black hand) graphically threatening assassination, kidnapping, arson, mutilation, etc., if demands for money weren’t met. http://en.wikipedia.org/wiki/Black_Hand_(extortion). Immigrants with family-members remaining in Italy, were particularly vulnerable to this type of crime. - Soon, within the densely-populated Italian enclaves, ‘Mafiosi’ were employing all their familiar, brutal tactics to establish the widespread belief that if you didn't keep paying them for salvation, you were doomed. The sustainable racket euphemistically-known as ‘selling protection/insurance,’ remained the base activity, but other crimes included trafficking in illegal immigrants. -‘Mafia' usually hid behind a front of a banal, Italian, family-owned, commercial enterprises. However, internally they were classic totalitarian dictatorships in microcosm - centrally-controlled and requiring of their adherents an absolute subservience to the group and its patriarchal leadership above all other persons. It didn't take the bosses long to discover that the more, counterfeit 'commercial' fronts they created, and/or subverted, in the USA: the more difficult it became for inexperienced, non-Italian, law enforcement agents to fathom what was lurking behind them. - Typical ‘Mafia’ victims were non-English-speaking immigrants who already didn't trust the authorities, and who were far too scared to complain to law enforcement agencies. The few who did, were subjected to terrifying intimidation and they generally withdrew their complaints before any trial. Those who refused to bow down to the ‘Mafia,’ were invariably assassinated along with their family members (sometimes years afterwards). - Prior to 1919 (and the prohibition of the sale alcohol by a short-sighted federal law that was effectively-unenforceable), the problem of single ethnic gangs was largely-confined to their respective communities in cosmopolitan American cities. The authorities apparently never considered that, one day, they might pose a serious threat to democracy and the rule of law in the USA. As we all now know, during the 1920s, bootlegging enabled the most-ruthless gang leaders (not just Italians) to expand their activities and illegally acquire absolute control over capital sums which made them infinitely more powerful than State or federal law enforcement agencies. Cities like Chicago, became totalitarian enclaves within the republic - completely controlled by a handful of fabulously wealthy racketeers who had corrupted, and/or intimidated, and/or blackmailed, and/or assassinated, a remarkable number of political figures, judges, senior law enforcement agents, attorneys, public officials, journalists, editors, etc. 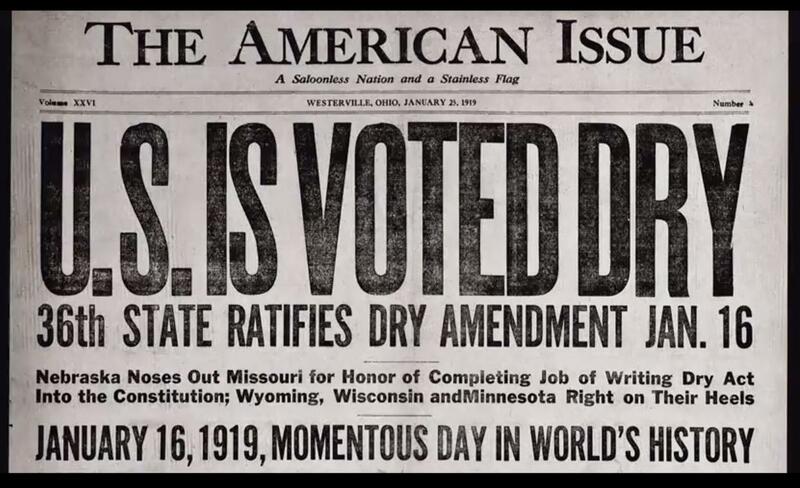 In effect, during the period 1919-1933, US federal legislators handed one of the nation’s most profitable industries and sources of tax revenue, into the hands of criminal psychopaths. By the time reality was faced, the damage had already been done; major organized crime was well and truly established in the USA. - By the 1930s, what the press called, a ‘National Crime Syndicate,’ had evolved. The various ethnic gang bosses of NYC and New Jersey began to co-operate - Italian, German, Irish and Jewish. - Eventually, the entire USA was secretly sectioned off into geographically-defined enclaves exploited by 26 gangs. Although a system of internal dispute resolution was introduced, during certain periods, bosses formed alliances with, and fought internecine wars against, other gangs in order to expand and protect their respective interests. - Italian racketeers, proved the most adaptable when prohibition ended, turning to: unlicensed gambling/bookmaking; prostitution; theft; fraud; blackmail; kidnapping; counterfeiting; usury (loan-sharking); drug dealing; etc. They followed their age-old, esoteric tactics and hid behind ever more-mystifying labyrinths of corporate structures pursuing unlawful, and/or lawful enterprises. These were maliciously created in order to prevent, and/or divert, investigation and isolate the final beneficiaries from liability. The corporate officers of individual 'Mafia' front-groups were usually non-initiates chosen for their innocent appearance (wives, young relatives, etc. ), and ignorance of how the 'Mafia' functioned. Consequently, if they were questioned, arrested or taken to court, they knew nothing that might endanger the bosses or the wider-operation. - Until the late 1950s, as far as most US law enforcement agencies were concerned, the ‘Mafia' bosses had maintained almost an absolute monopoly of information about their grandiose criminal objectives. In 1957, this monopoly was first publicly challenged (in respect of the 'Mafia's' corruption of trade union officials) by a Senate Committee chaired by John Little McClellan, supported by some attorneys within the US Dept. of Justice. - The 'Mafia' bosses were still able to sustain their wider activities by the enforcement of existing, arbitrary contracts and codes (secrecy, denunciation, confession, justice, punishment, etc.) within their ‘Families,’ and by their use of intimidation, and/or the infiltration of traditional culture, and/or corruption, and/or intelligence gathering, and/or blackmail, and/or extortion, and/or violence, and/or assassination, etc. to repress any internal or external dissent. 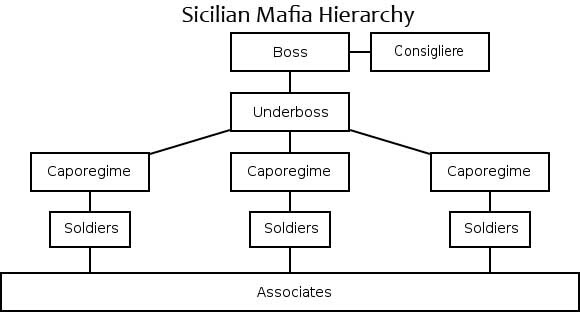 - Although the Italian American 'Mafia' was positively identified as a real phenomenon (referred to by its initiates as, 'Cosa Nostra' or 'Our Thing'), and various isolated 'Mafiosi, and their corrupt contacts, were imprisoned during the 1960s for individual crimes, the organization remained effectively above the law. In reality, what its bosses were doing (i.e. running an axis of secretive, and abusive, totalitarian States in microcosm, within a democracy), was, by its very nature, designed to keep them beyond the reach of the law. The above, was essentially the catastrophic situation that faced US federal legislators at the end of the 1960s. In reality, the law they enacted in 1970, sought to combat a form of pernicious cultism, or occult totalitarianism, but without listing the universal identifying characteristics of the underlying phenomenon. However, RICO is an important piece of legislation in that it officially recognized (after decades of official denial) that dissimulated, subversive/criminogenic organizations exist which have been maliciously constructed to deceive all but the most-intellectually-rigorous of investigators, and that their activities cannot be fully understood in isolation, because they form part of an overall pattern. In the end, RICO should probably be judged by the facts that it has not really been used effectively by federal prosecutors, and that 24 'Mafia Families' are still known to survive, whilst major organized crime has become an ongoing global problem. Theoretically, under RICO, in the USA an individual who is a member of any enterprise that has committed any two of 35 crimes (27 federal and 8 State) within a period of 10 years can be charged with ‘racketeering.’ The penalty for this crime is a fine of $250 thousands, and/or 20 years in prison, per racketeering count. In addition the convicted racketeer must forfeit all benefits, and any interest on these benefits, derived from a pattern of racketeering activity. RICO also allows for a private individual victimized by the actions of a criminal organization to file a civil suit against the racketeers, and, if successful, claim triple damages. Furthermore, when an individual is indicted under RICO, the US Attorney has the option of seeking a pre-trial restraining order or injunction to seize the defendant’s assets and, thus, block the transfer of illegally acquired-property which might be forfeited in the future. During the 1990s, the author of RICO, Prof. G. Robert Blakey, was retained by attorneys acting for the 'Proctor and Gamble' company to offer his expert opinion of the 'Amway Corporation.' The result was, what has become known as, 'The Blakey Report.' At one time, I exchanged e-mails with G. Robert Blakey. For obvious reasons, he was not at all helpful and he advised me that, if I published any part of his report, he would be obliged to take legal action against me; apparently, on the grounds that his report was subject to a legal settlement in which Proctor and Gamble's attorneys agreed that his opinion of 'Amway' had been confidential and would be kept confidential. Strangely, Prof. Blakey also informed me that his once-confidential report had, in fact, been stolen from his office by an assistant, and posted on the Internet without his permission. When you read it, it's not difficult to see why the bosses of 'Amway' didn't want the wider-world to know what the author of the RICO Act thought of their hidden activities. Ironically, when the wider-evidence is examined, 'Amway's' attorneys' failed-attempts to suppress this key-information clearly form part of an overall pattern of ongoing, major racketeering activity (as defined by the Racketeer Influenced and Corrupt Organizations Act, 1970, and clarified by subsequent US Supreme Court judgements). It is my opinion that G. Robert Blakey (who apparently was only given access to a very limited amount of evidence about the 'Amway' mob), began to identify (in his particular terminology) one section of a wider criminogenic phenomenon which I have described as representing (due to its unchecked, multi-billion dollar growth and extensive infiltration of traditional culture) perhaps the greatest threat to democracy and rule of law, of any latter-day form of pernicious cultism. Sadly, various essentially-identical 'MLM prosperity Gospel' mobs, now form a powerful global syndicate of organized crime, the existence of which is still largely-unthinkable to casual observers (including, legislators, law enforcement agents, judges and journalists). The following is taken from 'Black's Law Dictionary,' page 1286 (8th ed. 2005). In 1970, the RICO Act was passed with the purpose of attacking organized criminal activity and preserving marketplace integrity by investigating, controlling, and prosecuting persons who participate or conspire to participate in racketeering. Racketeering has two pertinent definitions. First, racketeering may be “a system of organized crime traditionally involving the extortion of money from businesses by intimidation, violence, or other illegal methods." Id. Additionally, 18 U.S.C. §§ 1961 et seq., defines racketeering as a "pattern of illegal activity (such as bribery, extortion, fraud, and murder) carried out as part of an enterprise (such as a crime syndicate) that is owned or controlled by those engaged in the illegal activity." Id. at 1287; see also 18 U.S.C. § 1961(1) (2005). This second definition has expanded the legal conception of racketeering to contain additional crimes, including the collection of illicit gambling debts, securities fraud, and mail fraud. Id. The RICO Act is open to broad interpretation, so it may be employed in a manner unintended by Congress. In one case, the U.S. Attorney stated that a perpetrator who attacked an abortion clinic could be charged under the RICO statutes if he acted as part of an organization. Joseph Berger, Prosecutors to Present Clinic Doctor's Slaying to Grand Jury,N.Y. TIMES (Apr. 20, 1999) at B5. Commenting on a civil lawsuit brought against an anti-abortion group, one Florida Representative said, "It was never the intention that the law be used against advocacy groups." SeeClinic bomb victim speaks against bill to curb RICO, FORT WORTH STAR-TELEGRAM Jul 18, 1998 at 7. The RICO statutes can be applied in both criminal and civil cases, for a plaintiff can file a suit against a defendant for treble damages. id. at 1286. Consequently, both prosecutors and plaintiffs have reason to claim that many actions are punishable under the RICO statutes. 18 U.S.C. § 1962 (2005). Under this section, there are three different crimes that can be committed, plus an additional conspiracy provision. in acquisition of any interest in, or the establishment or operation of, any enterprise which is engaged in, or the activities of which affect, interstate or foreign commerce. 18 U.S.C. § 1961(a). Under section 1962(d), it is a crime for any person to conspire to violate any of the provisions of section 1962. Id. § 1962(d). Section 1962(a) generally does not apply to a purchase of securities on the open market for purposes of investment, and without the intention of controlling or participating in the control of the issuer, if the securities of the issuer held do not amount in the aggregate to one percent of the outstanding securities of any one class, and do not confer, either in law or in fact, the power to elect one or more directors of the issuer.) 18 U.S.C. § 1962(a). 18 U.S.C. § 1963 (2005). both. 18 U.S.C. § 1963(a). any interest the person has acquired or maintained in violation of section 1962. 18 U.S.C. § 1963(a)(1). Furthermore, in lieu of a fine otherwise authorized by this section, a defendant who derives profits or other proceeds from an offense may be fined not more than twice the gross profits or other proceeds. 18 U.S.C. § 1963(a). The remaining provisions of section 1963 concern forfeiture procedures. 18 U.S.C. § 1961 (2005). which is chargeable under State law and punishable by imprisonment for more than one year; 18 U.S.C. § 1961(1)(A). section 831 (relating to nuclear materials). Id. § 1961(1)(B). an act which is indictable under title 29 U.S.C. § 186 (dealing with restrictions on payments and loans to labor organizations) or 18 U.S.C. § 501(c) (relating to embezzlement from union funds). Id. § 1961(1)(C). the felonious manufacture, importation, receiving, concealment, buying, selling, or otherwise dealing in a controlled substance or listed chemical, punishable under any law of the United States. Id. § 1961(1)(D). if the act indictable under such section of such Act was committed for the purpose of financial gain. Id. § 1961(1)(F). "enterprise" includes any individual, partnership, corporation, association, or other legal entity, and any union or group of individuals associated in fact although not a legal entity. 18 U.S.C. § 1961(4). "pattern of racketeering activity" requires at least two acts of racketeering activity, one of which occurred after the effective date of this chapter and the last of which occurred within ten years (excluding any period of imprisonment) after the commission of a prior act of racketeering activity. 18 U.S.C. § 1961(5). which was incurred in connection with the business of gambling in violation of the law of the United States, a State or political subdivision thereof, or the business of lending money or a thing of value at a rate usurious under State or Federal law, where the usurious rate is at least twice the enforceable rate. Id. § 1961(6)(B). "racketeering investigator" means any attorney or investigator so designated by the Attorney General and charged with the duty of enforcing or carrying into effect this chapter. 18 U.S.C. § 1961(7). 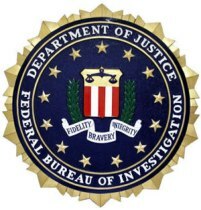 "racketeering investigation" means any inquiry conducted by any racketeering investigator for the purpose of ascertaining whether any person has been involved in any violation of this chapter or of any final order, judgment, or decree of any court of the United States, duly entered in any case or proceeding arising under this chapter [18 USCS §§ 1961 et seq.]. 18 U.S.C. § 1961(8). As can be clearly seen from section 1961, the list of affiliated activities is quite large and many organizations and individuals can easily find themselves subject to the stiff penalties and sanctions afforded under RICO. As a preliminary matter, it should be noted that, while the Act refers to "Criminal Organizations," membership in organized crime is not a necessary element of a RICO conviction. United States v. Uni Oil, Inc. 646 F.2d 946, 953 (5th Cir. 1981). In order to secure a conviction under the RICO Act, the government must prove both the existence of an "enterprise," and a connected "pattern of racketeering activity." United States v. Turkette, 452 U.S. 576, 583 (1981). An enterprise is an entity, and it can be proved by evidence of an ongoing organization, and by evidence that the carious associates function as a continuing unit. Id. The pattern of racketeering activity is a series of criminal acts, which can be proved by evidence of the requisite number of acts of racketeering committed by the participants in the enterprise. Id. Proof of one, however, does not necessarily prove the other. Id. Furthermore. Racketeering enterprises or racketeering predicate acts do not need to be accompanied by an underlying economic motive. NOW v. Scheidler, 510 U.S. 249, 259, 261 (1994). To clarify how each of the three subsections of section 1962 operate, the case Kehr Packages v. Fidelcor, Inc., 926 F.2d 1406 (3rd Cir. 1991) is informative. Under section 1962(a), the plaintiff (or government) must allege an injury specifically from the use or investment of income in the named enterprise; under section 1962(b) the plaintiff (or government) must allege a specific nexus between control of a named enterprise and the alleged racketeering activity; and while section 1962(c) is not subject to these nexus limitations, cases brought under section 1962(c) cannot allege that an entity is both an enterprise and a defendant. Kehr at 1411. In establishing a pattern of racketeering activity, the prosecutor must show that racketeering predicates are related and that they amount to or pose a threat of continued criminal activity. H.J., Inc. v. Northwestern Bell Tel, Co. 492 U.S. 229, 240 (1989). This may be done in a variety of ways. Id. at 241. "A party alleging a RICO violation may demonstrate continuity over a closed period by proving a series of related predicates extending over a substantial period of time. Predicate acts extending over a few week or months and threatening no future criminal conduct do not satisfy this requirement." Id. at 242. Congress, apparently, "was concerned in RICO with longterm criminal conduct." Id. If continuity cannot be established by showing longterm activity, "liability depends on whether the threat of continuity is demonstrated." Id. (emph. in original). Because "threat of continuity" depends on the specific facts of each case, it can be sufficiently established "where the predicates can be attributed to a defendant operating as part of a long-term association that exists for criminal purposes." Id. at 242-43. The continuity requirement can also be satisfied by showing "that the predicates are a regular way of conducting defendant's ongoing legitimate business (in the sense that it is not a business that exists for criminal purposes), or of conducting or participating in an ongoing and legitimate RICO 'enterprise.'" Id. at 243.
enterprise is separate and apart from the pattern of racketeering activity. United States v. Sanders, 928 F.2d 940, 943 (10th Cir. 1991).